I named this quilt Farmer's Wife Improv, each time I told my daughter she looked a little confused and asked why I did not call it improve. Gotta love the beautiful minds of our children! My decision to start a Farmer's Wife quilt was made on January 2, 2012. I started immediately. It did not take long for my 7 year old daughter to make a request that the quilt was hers. I of course obliged. We decided that the quilt would be made with solids and I chose Kona Solids. My daughter picked the colours; purples, blues and greens. Each block she helped pick the colours that we used. She did a great job. It did not take long (well actually it did take long) to decide that I could not complete the 83 blocks required to make the twin size quilt and I moved on to plan B, build up each block. This was a good decision in two ways, I was actually able to complete the quilt and I was able to make each block the same size, something I had not accomplished with the small blocks. 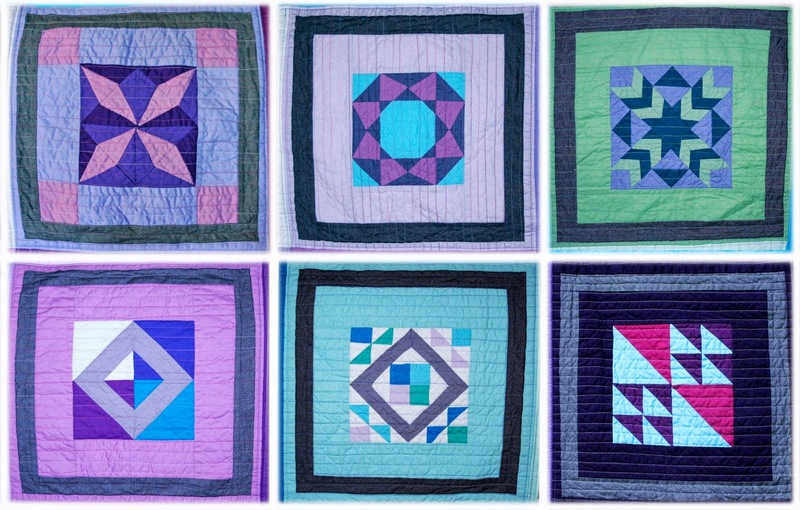 I was loving how each block came out and pictured them in a random pattern on the finished quilt. The above blocks are some of my favourites! If you look very carefully you can see that I used different colours of variegated thread to quilt each one. Size: approx. 73" x 89"
I am linking up with Quilt Story and Better of Thread; see my Link Up page.